Some frequently asked questions for both online and in-store customers to help you with your shopping experience at Shoe Republik. 1.1 How can I contact you? If you have a query in relation to stock in one of our stores, please contact the specific store directly where the staff there can assist you. Before contacting us with any online related queries, please read through the FAQ first as you will most likely find the answer there. Please note we do not return calls on general/stock availability queries on the online order care line. For general queries, please us the contact form or raise a support ticket. We do not take orders over the phone. All orders must be placed via the website. If the order care line is busy, please leave a message and we will return your call if your query is order related. The order care line operates Tuesday to Friday from 10 am to 5.30 pm. It is closed Saturday to Monday and on all bank holidays and public holidays. 2.1 Was my order placed correctly? When you place an order with us, you will receive a confirmation email. Please retain this email as you will need your order details for any future queries. 2.2 I placed an order but I didn't receive a confirmation email? - Please check your email spam or junk folder as it may be there. - Your mailbox may be full, you may need to free up some space. - Please check the email as you entered it during the order process, spelling errors in the email address is a common error. If you still cannot find your confirmation email or need it to be re-sent, please contact us. 2.3 I placed an order but didn't complete the payment. How do I complete it? There are a few options to complete your order. When you fail to complete a purchase you will receive some automatic payment reminder emails. There is a link in that email, simply click on it to re-open your cart and complete your purchase. Alternatively if you registered for an account on the site, simply log in and your order should be visible in the 'Recent Orders' section of your account. Just click on the order to re-open your cart and complete payment from there. If you didn't register and chose a guest account, you can still register on the site by using the same email that you used to place your order. This will convert your guest account to a customer account. Once you have registered your order should be visible in the 'Recent Orders' section of your account. Just click on the order to re-open your cart and complete payment from there. 2.4 The product I want appears to be sold out. Will it be available again? If you would like to inquire about future availability of a product, just click on the 'Contact us about this product' link and fill in the contact form that you will be directed to. We will get back to you about the next availability of the product in due course. 2.5 What happens if the product I ordered is out of stock? This rarely happens, but should it occur we will issue an immediate full refund. Sometimes an item is sold instore, and before the sale has been updated to the website the same item is sold again online within a short timeframe. This results in over-selling. If the item is being re-stocked we will offer you the choice of waiting for the product prior to issuing you the refund. 2.6 Can I cancel or change my order? Pre-dispatch: No problem! We can cancel an order up until it is dispatched. Just contact us as soon as you realise your error. Post-dispatch: Obviously if the order has already been dispatched immediate cancellation is not possible. Bummer! However you can still return the goods to us following delivery. Under the Distance Selling Regulations, you may cancel your order for any reason by giving us written notice within 7 working days, starting the day of receipt of your delivery. Written notice must be by email or by post. However, for the convenience of our customers, in practice we operate an extended 21 day returns policy, starting the day of receipt of delivery. So this should give you ample time to return the product. To view the full details including contact information, on cancelling an order, please refer to our Terms & Conditions (point 8). 3.1 What payment cards or services can I use at Shoe Republik? You can pay using Visa, MasterCard, Maestro, American Express, iDeal or PayPal. 3.2 When is my credit or debit card charged? Your credit or debit card is charged at the moment you place an order successfully. 3.3 What is 3D Secure and why am I asked for an additional password when I pay with my card? Banks now require that online retailers use 3D Secure with all debit and credit cards. 3D Secure offers an extra layer of security for both the card holder and the retailer. For Visa it is called 'Verified by Visa' and for MasterCard it is called 'MasterCard Secure Code'. 3D Secure works by asking the card holder to enter a password (created by you) after the card details have been entered. So if someone gets hold of your card and tries to make a purchase online with it, they will not be able to proceed beyond the 3D Secure page unless they know the password too. Which is highly unlikely. This is a good thing that helps to protect your personal card security online. It is highly recommend that all credit and debit card holders enroll their cards in the 3D Secure schemes for added anti-fraud protection. 3.4 Why has my card payment been declined? For your own protection we take card security very seriously. Card payments are handled by our payment gateway partners, Mollie and PayPal, and can be declined for a number of reasons. The most common is the address/postcode/CV2 (three digit security code) number do not match correctly. Please make sure the address and card date details are correct. If the problem persists please contact your bank or card issuer. If you receive the error "Your card is not compatible" or similar, see point 3.5 below. If you are an international customer you may receive this error when trying to pay with a Visa or Mastercard. The reason for this is as an anti-fraud measure we only accept card payments from cards with 3D Secure. Most of the credit cards issued in European countries feature 3D Secure. However consumers from outside Europe often hold cards that lack this additional security feature. In this case the payment rejection simply means that your card is not enrolled with the 3D Secure services 'Verified by Visa' or 'MasterCard Secure Code'. If you are receiving this error you will need to pay with your card via the PayPal option instead to complete your order (you do not need a PayPal account). 3.6 Why has my 3D Secure authentication failed? When 3D Secure authentication fails it means that you haven't passed the additional security checks by your bank. It doesn't mean that there isn't enough money on your card/account, it just means that you're not enrolled in the 3D Secure system or that you entered an incorrect password. 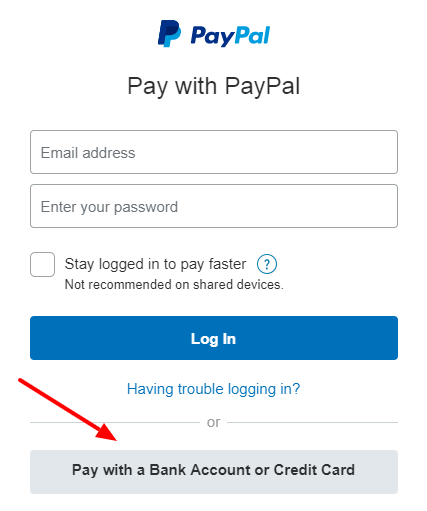 3.7 Do I need to have a PayPal account to pay via the PayPal option? No you do not need a PayPal account to use this option. Simply click on the "Pay with a Bank Account or Credit Card" button to pay directly with your card instead. 3.8 How do you process refunds? Refunds are returned to your original method of payment, as per standard practice. Credit and Debit card refunds can take up to 30 days depending on your card issuer, but usually appear after 7-10 business days. PayPal refunds can take up to 30 days but are usually processed within 2/3 business days. The amount of time it takes for a refund to be processed back to you depends on your payment provider and is beyond our control. 4.1 Do I qualify for the free shipping promotion? What are the t&cs? Our Free Shipping promotion applies to customers in the Republic of Ireland and Northern Ireland only, whose total order value is €75 or more. Terms & Conditions: Free shipping only applies if you keep your full order. If your purchase qualified for free shipping but you subsequently return an item(s), your refund amount will be deducted the shipping fee of €3.50 if your new total transaction value falls below €75, and thus no longer qualifies for the free shipping promotion. e.g. You purchase two items (€70 + €30) totaling €100 and you select 'Free Shipping' as your chosen delivery option. You subsequently return the €30 item. Your new total transaction value is now €70 and thus falls below the €75 threshold for free shipping. Your refund will be €26.50 (€30 - €3.50). 4.2 Is a signature required on delivery? Yes all Shoe Republik deliveries require a signature from the recipient on delivery. All deliveries are fully tracked including signature, time and date of delivery. 4.3 How long will delivery of my order take? All the information regarding shipping, international shipping and shipping costs can be found on the Shipping & Returns page. We aim to deliver all domestic Irish orders within two business days (priority) and 5 business days (standard), however this can depend on stock availability, stock location, time of year and courier pick up schedules. Please note Saturday, Sunday and Bank Holidays are not considered business days. All orders placed after 14:00 on Friday are not processed until the following Monday, and not dispatched until the following Tuesday. 4.4 How do I track the delivery of my order? You can track the progress of your delivery by visiting our Order Tracking Portal. Just enter the tracking number you have been provided with and click the Orange track button. You may need to allow up to 6 hours from time of dispatch for the tracking information to appear online. If you find that your tracking number is not working or is not returning any progress, please a raise a support ticket via your customer account area. 4.5 Can I re-arrange my delivery time or address mid transit? Yes this may be possible but you must liaise directly with the delivery services to arrange it. We cannot arrange this for you. Ireland & NI Customers: Visit the Fastway courier locator portal and enter your town/area name. You will find the name, contact number and timetable for your local Fastway driver. If there is no driver contact number available, you can call your local Fastway Depot instead. You can find the depot contact numbers at http://www.fastway.ie/contact-us. International Customers: This depends on the courier service that you have chosen. You will need to contact them directly via their local customer care centre in your country. Re-arranging delivery times is usually not possible if the package is being delivered by the postal service. 4.6 Can I arrange with the local driver to leave my parcel elsewhere without a signature? This is completely up to yourself, but you do so at your own risk. We do not give permission to any of our delivery partners to deliver parcels without a valid signature, or to leave parcels with neighbours or unsecured "in a safe place" at the destination address. This includes leaving packages in bins, porches, outhouses, sheds, back yards, gardens or private mail boxes. Nor do we advise any customer to avail of any of these options if offered. If there is no one available at your delivery address to accept the order, always try to re-arrange the delivery so it can be signed for. Should you agree to any of the above alternatives with your local delivery driver, please note you do so at your own risk. Shoe Republik will not be held liable for any loss or damage incurred to your parcel as a result. Should anything happen to your package in this instance, you will need to liaise directly with the delivery service to find a solution. If you receive a delivery whereby the delivery driver did not obtain a signature from anyone at your address, or your package was left in an unsecured place without your agreement, please contact us and let us know. 4.7 What should I expect when I receive my order? All orders shipped are quality checked to meet the high standards that our customers expect. A Pre Shipment Inspection (PSI) Report is created and signed off for each shipment. This report includes pre-shipment photos of the product and package as shipped to you. You should expect to receive the exact item(s) that you ordered, properly packaged in it's original box/packaging. Where possible we endeavour to ship 'box fresh' products to all of our customers. However we are unable to guarantee that every product dispatched will be 'box fresh' - i.e. there is a possibility they may have been tried on by customers in our high street stores. This is normal practice for any shoe retail business. 4.8 What if the package being delivered looks damaged? (a) When signing for the package ensure you write an additional note on the docket that the item arrived with packaging damaged. (b) Request to open the damaged package in the presence of the courier to check the contents are ok.
(c) Refuse to accept the package due to the damage. It will be returned to us for inspection. A delivery surcharge is an extra levy charged by the courier company for deliveries to destinations deemed as remote locations or off shore islands. For locations that are deemed as remote, a surcharge is usually applied in addition to the standard rate. The surcharge is usually in the range of €8 - €12. The delivery charges quoted on this site are standard country rates, and do not include surcharges for deliveries to these remote locations. Should your shipping address be deemed as remote by the delivery service, we will bill you separately via an email payment link for this surcharge amount. You will need to complete this payment before we can ship your item to you, or alternatively instruct us to cancel and refund your order. If you are a customer in a country outside of the European Union, when you import an item it is usually subject to local import taxes or custom duties. These charges are the sole responsibility of you, the importer, to pay. They are levied by your local government, they are not charged by us or by our delivery partners. Neither Shoe Republik or our delivery partners have any control or influence over these charges. They simply collect the charges on your government's behalf. Depending on your locale, you may be charged a handling fee to manage the duty collection. Any subsequent handling fees (as a result of custom charges) are also the sole responsibility of you, the importer, to pay. Before you place an order, it is advised that you research any potential import tax or customs duty in your country so that you are aware of any charges that may be incurred for your order. As these taxes and the method of calculation varies from country to country and are subject to change, it is not possible for us to advise you on these charges particular to your country. On receiving a payment request for customs charges, you will need to liaise with the local customer service agent to arrange the payment of the charges on your purchase. The delivery service should also be able to provide you with a breakdown and calculation of the charges, should you require it. If you dispute the charges you will need to query it with customs & excise in your country as these charges are essentially between you, the importer, and your country's Customs & Excise department. Please note that customs charges will not be refunded if you subsequently cancel or return your order. If you cancel your order by refusing to accept delivery of all or part of your order (where the products or packaging do not appear to be damaged or defective) or by refusing to pay the customs charges levied, you will be responsible for any customs fees, postal charges or package repatriation costs incurred by the retailer. Any such charges due to a package being refused will be deducted from your merchandise refund. 4.11 Will deliveries be delayed during the Black Friday/Christmas/New Years periods? Yes it is likely that during the busy Black Friday, pre-Christmas and holiday periods deliveries may take longer than usual due to courier services being over stretched. Orders placed during the annual Black Friday and Cyber Monday weekend will take a little longer to process and dispatch than usual due to the increased volume experienced over this weekend. Please allow an extra 7 working days for delivery. Priority shipping services (such as 2 day delivery) may take a little longer during this busy period due to delivery services experiencing back logs of packages. Please note priority shipping services (such as 2 day delivery) to UK addresses may take a little longer during this busy period due to delayed processing times. For pre-Christmas deliveries, please refer to the updated cut-off dates and advice listed on the Shipping & Returns page. There are no shipping or courier services available for the period December 21st to January 2nd. It is advised that you do not purchase priority shipping services (such as 2 day delivery) if ordering online during these dates. All purchases made on or after these dates will be shipped from January 3rd, irrespective of what delivery service was purchased at checkout. 5.1 What advice would you give for trying on my shoes at home? Before trying on your shoes, please pay attention to the enclosed advice leaflet that we include with every purchase. When trying on your shoes, please do so in a carpeted area to avoid any damage or wear to the outsole. Always try on your shoes with clean socks or tights. It is advisable to use a shoe horn or similar entry aid when trying on a new pair of shoes. Be careful forcing a shoe on if the shoe does not appear wide enough. Forced entry typically causes damage to the upper and entry point of the shoe. This would void any return rights. You will need to use your own judgement here. Please take care of all original labels, tags, tissues, fillers and boxing. Should you need to return the item you will need to return all of these intact to qualify for a refund. So don't be tempted to tear off those tags and labels right away! Finally, it goes without saying that shoes must not be damaged or worn outside and no scuffing or wear should appear on the sole. No creasing or any other obvious sign of wear should appear on the uppers. Remember when returning an item, the item has to be returned in a saleable condition. If it cannot be resold, it cannot be refunded. If you wear your shoes outside, they are yours to keep. 6.1 What is your returns policy? If you are not completely satisfied with your purchase, you can cancel your order by requesting a return within 14 days from the date you received the item (see 5.2 How do I return something to you?). You will then have 14 days from the cancellation request date to return the item to us. You must return your purchase in its original unworn condition with all product tags and packaging intact. You must also ensure that you prepare and package your return appropriately, with appropriate outer packaging. If the product(s) or product packaging arrives back damaged, it will void your return as it will be deemed as not resaleable. If the product you purchased included a free gift or promotional item, the free gift or promotional item must also be returned. For clarification purposes, the 14 day cancellation window and subsequent 14 day return window refers to regular calendar days (not business days). These periods will be strictly enforced, cancellations or returns will not be accepted outside these periods. 6.2 How do I return something to you? You can return an item to us by using the returns process in your customer account. Customers must have an account to create a return shipment. If you place an order as a guest, you will have to register with the same e-mail address to convert your guest account into a customer account. Under recent orders click View for the order you want to create a return for. Give a return reason. You can choose a reason and an action or create your own. 6.3 I placed an order as a guest/I didn't create a customer account? If you place an order as a guest, you will have to register with the same e-mail address you placed the order with to convert your guest account into a customer account. Customers must have an account to create a return shipment. 6.4 How do I prepare my package? Simply prepare your package by repacking your product back in its original packaging, making sure to include all original tags, fillers and tissues. Ensure that shoes are unworn. For shoes it is advisable to place a rubber band around the box to keep the lid intact during transit. Use a strong mailing post bag or cardboard box to protect the product packaging. 6.5 How should I return the item? You should always use a recorded delivery service such as a tracked courier service or registered post to return items. Value for money services in Ireland and Northern Ireland include City Post, Parcel Connect and Parcel2Go. These services can sometimes offer better rates than registered post, depending on the weight of your package. It is recommended that you declare the full item value for insurance purposes. This gives you protection in the event that something goes wrong. It's important to remember that while standard post or standard delivery services are the cheaper option, they offer you no protection or come back if your returned item goes missing or gets damaged in transit. Shoe Republik accepts no responsibility or liability for packages/items that are lost/stolen/damaged in transit during the returns process. 6.6 What happens after I've returned an item? After you have submitted your return request, you can follow the status of the return process by logging in to your account. New - Standard status of every new return. Authorized - Return request approved and we are waiting to receive your returned product(s). You can now ship them back to us. Repaired - Replacement/repaired product has been shipped to you. Refunded - Your return shipment has been processed and you have been reimbursed. Rejected - Return rejected - unauthorised return or products returned do not comply with our return conditions. Cancelled - Return shipment is no longer valid or your 14 day returns window has expired. On receiving your returned item, we will examine the product(s) to check that they are in their original condition. If your return qualifies for a refund, it will be automatically issued to the card or service you used to place the original order. You may need to allow up to 30 days before your card provider processes the refund, but usually it rarely takes this long. Please note for rejected returns (such as damaged product that cannot be returned due to incorrect or inappropriate use), you will be required to pay for the costs of having these items shipped back to you. If there is an issue with any returned item, we will contact you to discuss it. To view the full details on returned items, please refer to our Terms & Conditions (points 5 & 6). 6.7 Can I return sale or discounted items? Yes of course, the standard returns terms & conditions apply. 6.8 Can I return shoe care products? Sorry but we do not accept returns of any shoe care products such as sprays, polish, wax, gel, laces, insoles etc. Product in sealed packaging such as blister packs or similar cannot be returned once opened due to re-sale and hygienic reasons. 6.9 Do you offer an exchange? No we do not offer a direct exchange. Your original order will be refunded (minus any shipping charges) once we receive it back. When returning your order you may request an alternative product/size, which we can hold for you. You will then need to place a new order. A new order is required as it needs a new tracking number which allows full trace-ability of your order and related payments. 6.10 Do you refund shipping costs? No we do not refund shipping costs associated with your order. Shoe Republik uses priority expedited shipping services for all orders for full trace-ability and fast delivery. The costs of shipping + any applicable VAT will be deducted from your total refund amount. You will only receive a refund for the value of the returned product. 6.11 What happens if my returned item is rejected? Products which are not returned in their original condition as outlined, and/or are deemed as worn or not re-saleable by us after examination, will not qualify for a refund and your return will be rejected. Products that are returned to us after the allowable 14 day return period will also be rejected. In this scenario you will be contacted via email by our customer services team to explain the decision and to arrange re-delivery of your goods. Re-delivery will be chargeable via a payment link sent to your email address. 6.12 What is your returns policy for faulty products? If you feel that your product has a manufacturing fault please request a return via the returns process in your customer account, or alternatively you can raise a support ticket via your customer account area to discuss and arrange a return. You will need to quote your order number to help us deal with the claim. For faulty claims we may require you to provide photographic evidence of the fault - this is to enable us to view the fault in order to deem whether it qualifies for a claim. This can potentially save time and cost for the customer as well as reducing the scope for any misunderstandings in relation to the fault. For example on some occasions customers report material/colour variations as a fault when in fact it is just a characteristic of the material and is intentional. 6.13 What does/doesn't constitute a valid footwear fault claim? A claim is only valid if the fault is a manufacturing fault that pre-existed in the product prior to the product being used, and if the fault affects the wearability and function of the shoe. Examples of this would be a waterproof shoe that is letting in water due to a faulty membrane, a stitched down sole unit that has unravelled from normal wear due to poor stitching, a sole unit that has lifted due to poor gluing, a buckle or a velcro fastening that has broken from normal wear, a central feature embellishment that has broken etc. A claim would not be deemed valid where for example a shoe has worn down from normal wear & tear or for products damaged through inappropriate use, misuse, carelessness or self-inflicted damage - these do not qualify as manufacturing faults. For example, kids often badly damage the uppers and soles of their shoes by inadvertently using their shoes as brakes when riding bikes, skateboards and scooters. A frustrating and expensive lesson yes, a manufacturing fault - no. Minor/secondary embellishments or decorative elements that do not have a function and are only for decorative purposes - such as brand logos, beading, trims, studs, diamantes, dummy buttons etc - these are not covered by any guarantee and must be repaired by the customer themselves. The same also applies to kids shoes with gimmicks such as lights. The lights are not guaranteed, they do not affect or contribute to the function of the shoe and no guarantee can be given on how long they will last. 7.1 What payment methods do you accept? We accept cash and all major debit and credit cards for in-store purchases. However we do not accept cheques or third party gift cards such as One4All. 7.2 Why is the box/packaging compulsory with each purchase? The packaging forms part of the product at the point of purchase and thus it is part of the sale contract. All products sold in Shoe Republik stores are bagged and handed over to the customer with original box/packaging intact, without exception. Should you still wish to dispose of the box/packaging in-store, we are happy to accommodate this for you, but only AFTER the sale has taken place. Please be aware that by choosing to dispose of the packaging, you are waiving the option of returning your purchase for an exchange or credit note. We cannot accept returns of loose shoes or products without the original box or tags for re-sale and stock control reasons. No box = No Exchange. *Packaging includes the original box and outer packaging, and all product tags. 7.3 Why is it important to retain the original box/packaging & receipt? Should you wish to subsequently return your purchased item for whatever reason, you must return it in it's original box/packaging in order to qualify for an exchange or store credit. As such we recommend that customers always keep both the receipt and box/packaging of all purchases in case this eventuality arises. Customers can change their mind on a purchase for a variety of reasons - don't like it, doesn't fit properly, change of outfit, purchased wrong colour, purchased wrong size, product not suitable etc. All returned products must be returned in a resellable condition, so that they can be resold in-store and online. This includes the original box, packaging and tags. 7.4 Can you email me my receipt? Yes we can email you your receipt. Just ask at the point of purchase and the cashier will have it sent by email instead of printing it out. Not only is it more environmentally friendly, it also provides you with a permanent copy that you can't lose! 7.5 What are the advantages of creating a customer account? If you are a regular shopper with Shoe Republik it is best to create a customer account. A customer account records all your purchases and returns under your name, which means you do not need to worry about retaining receipts or proof of purchase when carrying out transactions. In order to open a customer account you will need to provide a contact number and a valid email address. 8.1 Do you take deposits/allow payment instalments? Yes we provide a deposit and layaway service for all customers on full price items only, subject to terms & conditions. Sale items that are reduced to clear cannot be put on layaway. 8.2 Why do I need to create an account to open a layaway? To reserve the product for you and to manage your deposit payments, an account has to be created under your name. Every payment instalment you make is then credited against this account. To create an account on the system you must provide a contact number and a valid email address - these are the minimum required fields. You are not required to provide any address or other personal details. 8.3 Is there a minimum deposit amount required? Yes the minimum deposit required to create a layaway is €20 or 20% of the purchase price for items over €100. After the initial deposit is paid, the subsequent amounts that you pay are entirely your own choice. 8.4 How long do I have to complete a layaway purchase? A layaway must be completed 30 days from date of initiation. So for example, if you create a layaway on June 1st you must complete the payments and pick up your purchase by June 31st. If you require a more extended payment period you will need to discuss this in-store. If an extended date over 30 days is agreed, you must agree to complete the purchase of your item by this date. 8.5 Are deposits refundable if I change my mind? No, deposits are non-refundable. When you pay a deposit you are paying in part for a product. Paying a deposit shows that you intend to buy the item and it means you are entering into a contract with Shoe Republik. If you pay a deposit and then change your mind, your layaway will be cancelled and you will lose your deposit. 8.6 What happens if I fail to pay for my layaway on time? If after 30 days you do not complete the payment of your layaway, you will receive a courtesy call or email to remind you to complete the purchase. If you ignore this, fail to respond or fail to complete the payment within an additional 7 days, your layaway will be cancelled and you will lose your deposit payments. 8.7 The product I have on layaway has since been discounted. Will I get the discount? No. When you pay a deposit you are paying in part for a product at an agreed price and within an agreed time period. Paying a deposit shows that you intend to buy the item at the agreed price and it means you are entering into a contract with Shoe Republik. You must pay the price that you originally agreed to. If the item has been discounted or put on promotion since you created the layaway, this does not affect the price of your layaway item. 8.8 Can I return an item I had on layaway? Yes but items purchased via the Layaway process can only be returned 7 days after the item has been collected and fully paid for. If you return an item purchased via the Layaway process and the item has since been discounted or reduced in price, you will only receive the current selling price and in the form of store credit. 8.9 Do you accept deposits on discounted sale items? No we do not accept deposits on discounted items or items that are on promotion/offer. No deposits are accepted or no new layaways are opened during sale periods. For seasonal sale periods, all customer layaways must be completed, paid for and collected by June 7th (Summer) and December 7th (Winter). 8.10 Why can't I put Van Dal products on layaway? Our in-store Van Dal section is a shop-in-shop concession that is ultimately run in conjunction with Van Dal themselves. As such we do not accept deposits for Van Dal products. Direct sales only. 9.1 Why is it important to have my children's shoes fitted? A child's foot does not fully develop until their late teens. Initially a babies foot consists of delicate bones made of soft, flexible cartilage. Ill fitting or poorly constructed shoes can have a significant negative impact on your child's foot health and posture. This is also the case for second-hand shoes - as shoes tend to take on the shape of the feet that wear them, they may be harmful to your toddler's feet. 9.2 How often should I get my child's feet measured? For babies and toddlers it is recommended that you should get your child's feet measured every 6 to 8 weeks. Kid's at this age can see rapid foot growth, babies feet can grow up to 3 sizes in their first year. You will typically need to change your child's shoes every three to four months during this phase. After the first 24 months, it is recommended that you should get your child's feet measured every 12 weeks. For children from the age of 5 onwards, it is recommended that you should get your child's feet measured every 16 weeks. On average a child's foot will grow two full sizes a year until they're four years old, and one size a year after that. However this is only a guide - obviously kids who are destined to have bigger feet will experience more growth spurts. 9.3 Are all children's shoes and brands standard fitting? No, unfortunately there is no standard fit in children's footwear. For example the UK brands Start-rite and Clarks both use a different fitting system whereby Clarks usually fit a half size bigger than Start-rite e.g. A Clarks size 8 would be 7½ in Start-rite. European brands all vary in fitting as well. Sports branded trainers usually fit much smaller, with most customers having to go up a size or two. It is important to remember that the measurement gauge is just a guide and that shoes have to be fitted properly in order to determine the correct size. 9.4 I did not receive the size I was measured on the gauge for? The measurement gauge is used as a guide only. For example, if you are measured on a Start-rite gauge, ultimately that measurement relates to Start-rite products only. It cannot determine the correct measurement for other non Start-rite branded products. Irrespective of the brand, shoes have to be fitted properly in order to determine the correct size and fit. This is because shoe lasts vary from product to product, as does the shape and composition of each individual child's foot. As such, it is possible that it may be necessary to go up or down in size from the gauge measurement. It's all about the fit, not the numerical measurement on the gauge. 9.5 My child is complaining that his shoes are hurting? If you feel there is a fitting issue following your purchase, you will need to return to the store as soon as possible (and within 10 days) with your child so that the fit can be re-checked. If the fit is deemed as too big/small after the re-check, we will issue you a replacement pair or a full refund. Unfortunately it is not possible to address fitting issues without doing the re-check. It is advisable to call the store in question ahead of any re-visit to make a re-fitting appointment with the sales assistant/fitter that you originally dealt with. Please note that it is possible that no fitting issues may be found following a re-check, and in this instance no replacement pair or refund will be offered. It may the case that your child's new shoes simply need to be worn-in. 10.1 What is your in-store returns policy? For in-store purchases we offer an exchange or store credit on any unworn/unused merchandise, provided that it is returned within 14 days, with proof of purchase and in it’s original box/packaging. Please note that we do not offer a refund on personally selected merchandise. It is our policy that the original box/packaging is compulsory with each purchase. The packaging forms part of the product at the point of purchase and thus it is part of the sale contract. All products sold in Shoe Republik stores are bagged with original box/packaging intact. We are sorry but we cannot accept returns of loose shoes without the original box for re-sale and stock control reasons. We recommend that customers always keep both the receipt and box of all purchases. No exchange will be offered on worn merchandise, including new merchandise worn out-of-shop. 10.2 What happens if I do not have my receipt/I return an item after 14 days? If you do not have your receipt or you attempt to return an item after the allowable 14 day period, accepting your returned item is completely at the store manager's discretion. Your return will only be approved if management are completely satisfied that the product was purchased in our stores. Regular staff/sales assistants are not permitted to accept returns without proof of purchase. Should the return be approved by management, you will be offered an exchange or store credit equal to the last marked-down selling price of the original purchase. Merchandise must be unworn and returned in its original box/packaging. 10.3 What happens if I do not have the original box/tags/packaging? We are sorry but we cannot accept returns of loose products without the original box and packaging for re-sale and stock control reasons. It is our policy that the original box/packaging is compulsory with each purchase. The packaging forms part of the product at the point of purchase and thus it is part of the sale contract. All products sold in Shoe Republik stores are bagged and handed over to the customer with original box/packaging intact, without exception. Products have to be returned in the same way in order to qualify for an exchange or store credit. 10.4 Why do I need to create an account to receive store credit? To issue you with store credit, an account has to be created under your name and the amount of credit is then issued against this account. You will then use this account to spend your credit on future purchases. To create an account on the system you must provide a contact number and a valid email address - these are the minimum required fields in order to make the account unique to you and also for us to be able to contact you should any account related issue ever arise. You are not required to provide any address or other personal details. 10.5 How long is my store credit valid for? There is no time limit or use-by date on store credit. Your store credit will be maintained on your account on our system and you can use it whenever you wish. 10.6 Can I return a product if it's slightly worn? No exchange or store credit will be offered on worn merchandise, including new merchandise worn out-of-shop. Once a product shows signs of wear it is deemed as used/second hand, irrespective of how little time it was worn for, and thus cannot be returned or re-sold by us. 10.7 Do I have to return free gifts? If the product you purchased included a free gift or promotional item, the free gift or promotional item must also be returned unused/unworn. 10.8 What is your returns policy during sale periods? We have a 7 day return policy during sale periods. Items returned outside of this time frame cannot be exchanged. We do not offer credit notes for returned sale items. If you return a sale item you must exchange it for another product on-the-day. You must have your original receipt if returning any items purchased during a sale or if returning an item purchased pre-sale at full price. If you do not have your receipt or cannot offer proof of the purchase price, you may be credited to the value of the last marked-down selling price at management's discretion, and only if management are completely satisfied that the product was purchased in our stores. 10.9 Where is your return policy displayed? In large A1 format at the point-of-sale in each of our stores. Pre-printed on the back of all purchase receipts. 11.1 How do I return a faulty item? You must have your original receipt or a proof of purchase for the product you are returning. We cannot accept faulty returns without proof of purchase. You may provide proof of purchase by way of a bank or credit card statement. In this instance the date on your statement will be compared with the transactions on our system around that date period, in order to recall your specific transaction. In some cases this may take some time as some banks/credit cards do not post transactions until many days after the actual transaction date, thus there may be some searching involved. You will need to be mindful of this if presenting a third party statement as proof of purchase. For example, it may not be possible to deal with it right away if the store in question is particularly busy on the day. Our staff will take receipt of your faulty goods and in return you will receive a Returns Remittance Slip. This is not an acceptance of liability. Our returns department will examine your goods. If the complaint is deemed worthy, a repair, replacement, store credit or refund will be issued as is deemed appropriate. If management can find no apparent fault with the goods, you will be contacted and informed of the decision, including an explanation as to why. In most cases you will be offered the opportunity for the product to be returned to the manufacturer by ourselves for testing and a second expert opinion on the matter. We will always accept the decision of the manufacturer following testing, even if it contradicts our own initial judgement. Please note that sales assistants or regular staff are not qualified to make a decision or judgement on faulty goods. Unless management are present to address the complaint on the day, the above procedure applies. You will then be contacted in due course. 11.2 What are your terms & conditions for returning worn/faulty items? There is a 90 day manufacturer’s guarantee (from date of purchase) on all our shoes. Returns deemed defective and which fall within the 90 day period will qualify for a full refund, store credit or exchange for an item of the same value. Returns deemed defective but which fall outside of the 90 day period may be entitled to partial credit of the original purchase value - this depends on the product in question, the level of wear and the original purchase date. This will be issued in the form of store credit only. In some cases returns are accepted on a goodwill basis (where the product is damaged but not necessarily due to a defect) - in these cases the level of compensation offered is at the complete discretion of management. Products where the damage is self inflicted by the customer, even through genuine error, do not qualify as a faulty return. No refund can be issued without specific proof of purchase, and in any instance where proof of purchase cannot be produced, store credit may be issued instead at the discretion of management, and only if management are completely satisfied that the product was purchased in our stores. 11.3 What instances wouldn't be grounds for returning goods? Goods damaged by not being used for their intended purpose (i.e. formal/dress shoes being worn as every day shoes, fashion boots being used as riding/field boots). Goods damaged by not being maintained or cleaned properly (i.e. using inappropriate polishes, creams or sprays on the upper materials, such as applying leather shoe polish to a synthetic upper. Using inappropriate cleaning detergents or methods to clean the shoes, such as putting shoes in the washing machine/dryer, drying shoes in the hot press etc). It is the customer's responsibility to read the labels on the product/packaging, to ask any questions they may have about same and to maintain the goods accordingly. An Error made by the customer is not a legitimate reason for return. Scuffing on shoes - scuffing happens due to actions where the upper material is repeatedly worn against an abrasive surface. It is a common problem with young children, especially in their formative years. There is no such thing as anti-scuff or scuff resistant leather/patent/synthetic or canvas materials. A scuffing issue can be easily corrected by observing the child in order to ascertain what he/she is doing to cause the scuffing. As scuffing is damage created by the wearer, it is not a manufacturing fault and therefore not a legitimate reason for return. Shoes worn in wet conditions that are not waterproof – leather is a naturally porous material and is not waterproof unless lined with GoreTEX or a similar tex waterproofing technology. Brand new leather soled shoes should never be worn in wet conditions. It is important to 'wear them in' on a dry day to build up a layer of grit on the soles, in order to protect the leather and extend it’s life. Delicate trims such as bead work or floral accessories are not guaranteed due to their delicate nature. Appropriate care should always be taken when wearing such items. It is the consumer’s responsibility to get these repaired. Gimmicks or gadgets, such as lights on kids shoes, are not guaranteed. Lights work off of touch technology, therefore the longevity of the lights cannot be guaranteed, nor can the battery be replaced. Shoe Republik utilises Facebook as an informational tool for it’s Facebook fans and customers. The information provided includes store opening times, store contact details, Google map locations, updates on new stock arrivals and information on promotions, offers, discounts and sales. We may also run competitions from time to time. Shoe Republik also utilises Facebook as a marketing tool for potential new fans and customers, usually via Facebook Ads, promotions and competitions. Shoe Republik does not utilise Facebook as a Customer Service channel or platform. Please understand that we do not deal with any customer service issues or complaints via any social media channel, including Facebook. Our company policy is to run our social media channels as marketing and informational tools only. As such our Social Media pages are administered by a third party service. Our Customer Service team does not administer our social media pages and thus our social media channels are not a suitable or appropriate platform for addressing customer concerns. For Customer Service queries, you should call or return to the store where you purchased the item(s) where your query can be dealt with appropriately by a qualified member of staff. Alternatively, or for purchases made online, you can email us, raise a support ticket, fill in the contact us form or call the customer care line. Shoe Republik will, where possible, try to answer any queries made by people on the Facebook timeline and/or via the private messaging service. However the response time may not be instantaneous as often the page is administrated by a third party. A quicker way to contact us is to either email us, complete the contact form or raise a support ticket. The Shoe Republik Facebook page is moderated using a combination of auto and manual moderation. Auto moderation is achieved by utilising Facebook page tools such as the Profanity Filter and Keyword Moderation. This means that if certain undesirable words are detected in a person’s post or comment to our Facebook timeline, the post or comment will be automatically rejected and blocked by the filters. Manual moderation is the maintaining of the Facebook page by the appointed admins. The page admins will remove any content that they deem inappropriate, including but not limited to any profanity, bad language, bullying behaviour, baiting, argumentative or aggressive posts, unsubstantiated claims or any other posts of which the content is deemed inappropriate. The page admins also reserve the right to ban any user engaging in this behaviour. Customer service queries that are not appropriate for the Facebook platform will be removed and directed to the appropriate channel to be dealt with accordingly. From time to time Shoe Republik may run offers or promotions on Facebook, some of which may be exclusive to Facebook subscribers only. The terms & conditions of any such offers or promotions will be strictly adhered to - i.e. If the promotion is a '20% off Ladies Footwear coupon on Saturday & Sunday', the coupon cannot be redeemed on Monday or against any non Ladies Footwear product. From time to time Shoe Republik may run competitions on Facebook, with a winning prize clearly defined for the winner. The terms & conditions of any such competition will be strictly adhered to - i.e. If a ‘Like & Share’ of a post or page is required as a condition of entry, the winning entrant must prove that he/she has satisfied both conditions. As a minimum qualification, all prize winners must be a subscriber to or have already liked the Shoe Republik Facebook page prior to the awarding of any prize(s). The winning prize must be claimed and redeemed within the time frame specified - the time frame or valid until date will not be extended. 13.1 Why can't I access shoerepublik.ie on certain browsers? If you cannot access our website on a certain browser it simply means that the browser in question is out-of-date and needs to be updated to it's latest version. Shoerepublik.ie constantly updates it's security protocols in line with the latest browser updates, therefore our site will not work with many older browsers using outdated technology. Using outdated browsers is never a good idea as without the latest updates it can leave you vulnerable to security and privacy issues online. Websites that accept credit cards need to comply with certain regulations to ensure their transactions’ security. These regulations are set by the Payment Card Industry (PCI) Security Standards Council and affect all online stores. The PCI council's latest directive requires all commercial websites to use up-to-date browsers by July 2018 so that they support the new, necessary versions of TLS security protocol (Transport Layer Security). Shoe Republik, in compliance with the PCI decision, will update all servers as per the requested deadline. This update will ensure continued privacy, for both transactions and customer data. As a result though, shoerepublik.ie will no longer be accessible for outdated browsers. We strongly recommend our customers to update your browser. Updating your browser regularly, or enabling automatic updates, is a necessary process that will help you increase and maintain safety when browsing or shopping online. 13.2 How do I report a bug/error on the Shoe Republik website? If you experience any errors, bugs or payment issues during your browsing or shopping experience on Shoe Republik, please report the issue by emailing support or by using the contact form on the right.